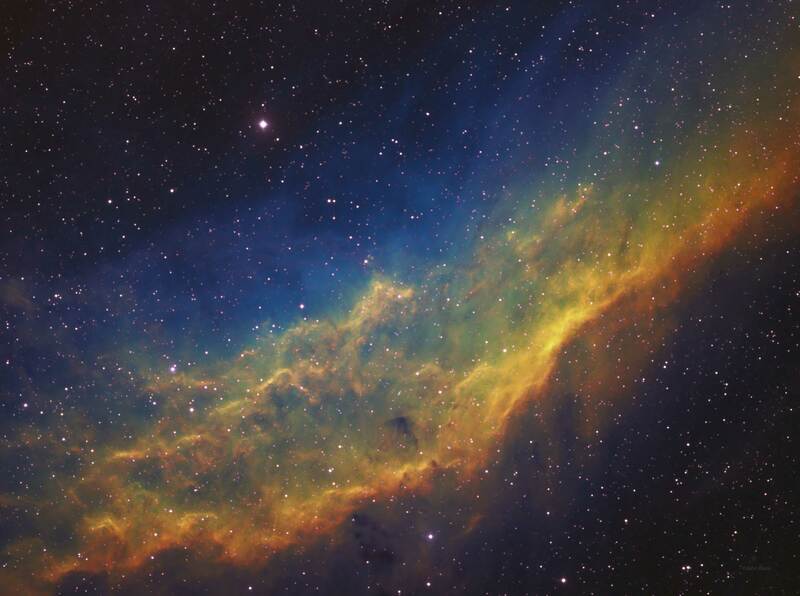 NGC 1499, also known as the California nebula, is a large emission nebula in the constellation Perseus. The nebula gets its name from the resemblance to the state of California. This large nebula resides in the Orion arm of our galaxy and is illuminated by the brightest star in the picture, Xi Persei. Xi Persei is also known as Menkhib on most star charts and is a very hot bluish white star whose temperature is about 66,000 degrees Fahrenheit. This is over 6 times as hot as our own sun. There is a very extreme stellar wind created by this star and it is illuminating the gas and dust that forms the shape of the California nebula.